SKU: N/A. Category: Mastic Powdered Adhesives. 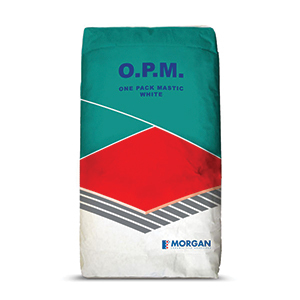 Morgan’s One Pack Mastic is a fast setting, non-slip, thin bed white mastic which cures to a high bond strength with superior flexibility. The adhesive has all the properties required of a mastic including excellent water resistance and is highly recommended for concrete swimming pools. One Pack Mastic installations can usually be grouted after only 6 hours. Available in 1 ton pallets, 20kg, 5kg and 1kg DIY pack sizes.